To start using Bizagi Web parts for SharePoint make sure you already have installed the Bizagi Web parts for SharePoint online. For more information refer to Bizagi Web parts for SharePoint Online . Bring the power of the best digital platform capabilities and BPM to your intranet by simply dragging and dropping Bizagi web parts into your SharePoint content. To start using Bizagi (i.e, access your inbox, work in pending tasks or create new requests) directly from SharePoint, edit your pages to include Bizagi Web parts and configure their properties. To do this, a SharePoint Web designer has 2 options as described and illustrated below (through the set of 7 different Web parts offered by Bizagi). 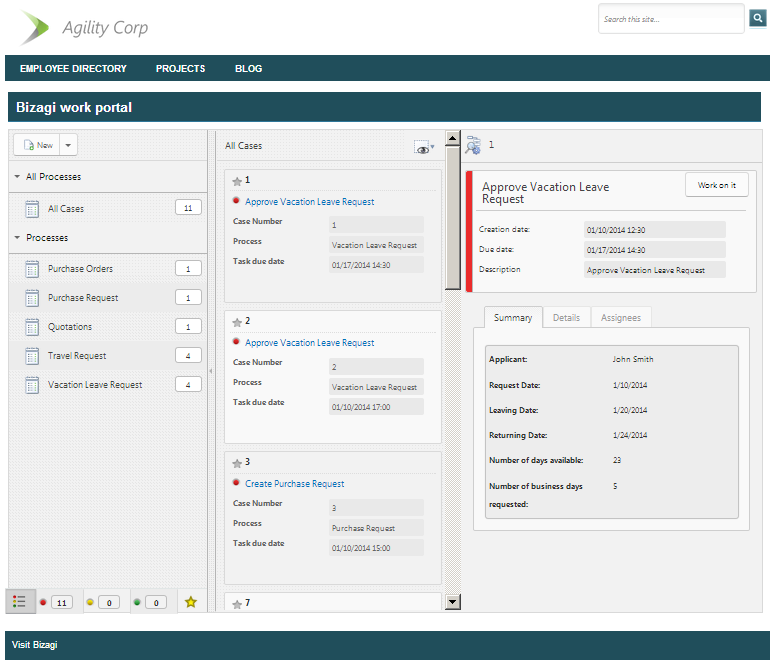 Achieve the fastest Bizagi + SharePoint integration by including the one Web part called Work portal, which features Bizagi Work portal as a whole inside of SharePoint content. This option requires minimal configuration since it will practically embed Bizagi Work portal into any chosen page. 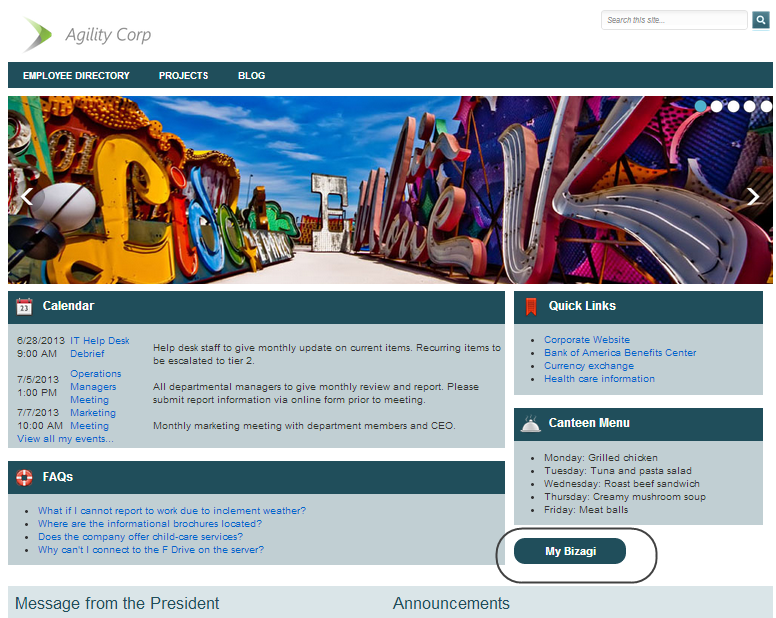 For more information and to view an example for this first option, refer to The Work portal Web part. Achieve a flexible Bizagi + SharePoint integration by including separately several web parts different to the one called Work portal. The other web parts available make up the aforementioned Bizagi Work portal Web part and we will mention them as the Specific web parts. These Specific Web parts are: Activity Form, My Inbox, Case summary, and Start Process list. In addition to these, there is an additional web part called Start Process button, which acts as a shortcut that you may use with either of the 2 options (the Start Process button will allow you to create shortcuts so that your end users can start Processes at one-click away). For more information and to view an example for this first option, refer to Custom options and advanced settings. 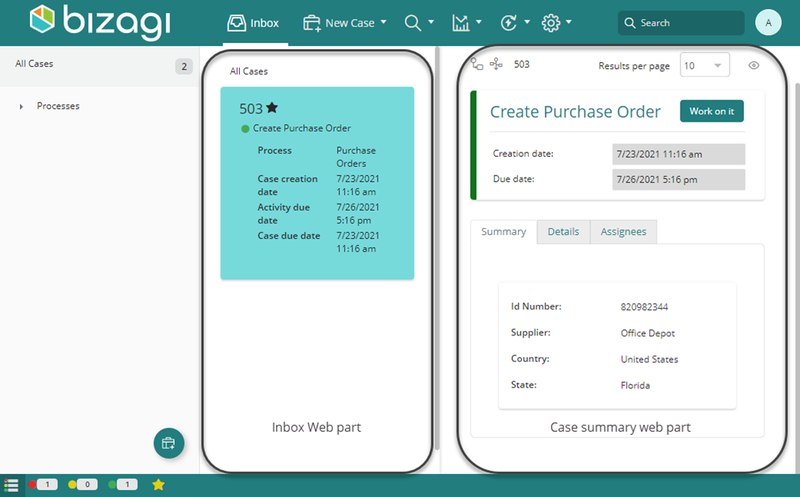 •Bizagi Web parts for SharePoint offer Bizagi Work portal's main functionality (such as: the possibility to create new cases, view the Inbox, and work in Activities and complete them). If a user needs additional functionality of Bizagi other than the ones presented above, then it is necessary to use such options directly from the Work portal in Bizagi (such as Administration options, Reports and Queries). •Other features currently not supported through Web parts are: the ECM control, printing options and the state log.